Preheat oven to 350 degrees F (176 degrees C). Spray a 9 inch round glass pie plate with cooking spray. 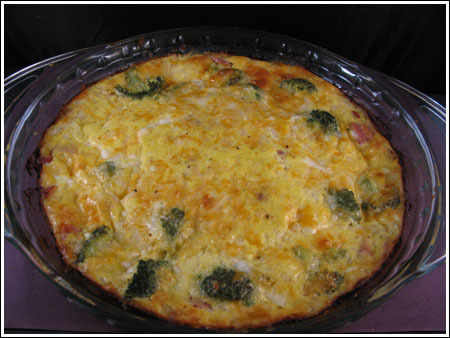 Layer broccoli, ham and onions across bottom of pie plate; sprinkle with parmesan cheese. Whisk eggs in a mixing bowl. Whisk in salt (if using), garlic powder, milk, cottage cheese and paprka. Toss cheddar cheese with flour and add to egg mixture. Pour egg mixture over quiche. Bake for 40 minutes or until set. Let stand for about 10 minute before serving. MASTERCOOK NUTRITION INFO — I am not sure it’s 100% accurate, but it sounds right. Making this quiche now…it looks like it’s going to turn out great! At first I thought I wouldn’t have enough egg, but when the milk and cottage cheese is added, it got all the volume it needed. Funny – I have been looking for a good egg dish like this without a crust! Thank you – it looks delicious! I love all the cookies too. Yum…looks great! I love quiche, too, but it IS so fatty. This one looks pretty doable. I need to make one before I start my next rotation b/c it will be good easy heat-up suppers. Cindy, I am glad you’re okay ;). Sue, if you decide to make it, let me know. I’d like to hear your thoughts. Katrina, does Kevin like scrambled egg dishes? Just curious. Sara, that’s the problem. The filling is the tasty part. The crust is good, but if you have a good filling you won’t really miss the crust (Note: I don’t feel this way about pie). Laurel and Rita, I’m glad you both scrolled down. Then again, I do foresee some changes around here. Not sure when or how. Snookydoodle, I’ve felt really unhealthy lately. Not necessarily because of the cookies themselves, but because I’ve been eating too many of them. LilSis, I’m sure you could make good cookies if you really wanted to, but I’m glad you appreciate the departure from cookies today. Piney, I’ll have to look for that Paula Deen quiche. I’m guessing it’s not reduced fat. Michelle, quiche is the easiest thing and yes, you can definitely leave out the broccoli. You might want to sub some spinach, though. Kalyn, thanks for the birthday wish! Happy Birthday to Rand. The quiche looks delicious. I saw your tweet about changing the blog a little and started thinking about it. You could keep the url and blog the same but just change the name to something like “Cookie Madness – and A Few Other Tasty Bites” or something that which implies that there are occasionally other recipes besides cookies. That would be a fun way to branch out but still keep the focus on cookies. And let me be one of the first to say Happy Birthday (in 2 hours and 10 minutes.) Your birthday is on the same day as the birthday of my fabulous brother Rand! Can I leave the broccoli out of this one? Not a fan! I love quiche…bring ’em on! I usually make Paula Deen’s recipe with the hash brown crust but would like to try something different! I’m really not great at baking cookies, though, I do try. So, I’m glad you’re doing a few different things and I LOVE quiche! I love broccoli in quiche also. Thanks for sharing the recipe. I’ve never made one with cottage cheese before, so I’ll definitely give it a try! You scared me there for a second! Not that I don’t like quiches, but I prefer cookies ;)! I usually do the not low fat versions with crust and all, but really should try this one next to compensate for the cookies, you’re right! Hope you had a great time during Christmas! I scrolled up to see if you changed your name…then I kept reading and was relieved. This looks great, I love quiche but the crust always makes it so rich and fatty. Looks yummy. The few times I’ve made quiche, even Kevin didn’t seem to care for it. Looks like a great protein, low carb dish! Thanks. I just found dinner for tonight! Glad you were just kidding! Gave me a heart attack at first!